A Star Wars-themed resort hotel and a new ship are among the expansion plans recently announced by Walt Disney Parks and Resorts during D23 Expo 2017 in Anaheim, Ca. Walt Disney Parks and Resort chairman Bob Chapek also provided details about the 14-acre Star Wars: Galaxy’s Edge coming to Walt Disney World Resort in Central Florida and Disneyland Resort in Southern California in 2019. 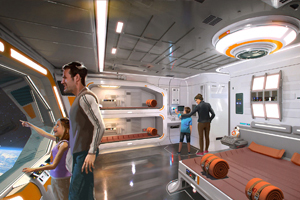 The two new signature attractions and immersive experiences include character encounters with BB8, Chewbacca, Rex and Kylo Ren. Plans at Epcot include a new Ratatouille-themed attraction (pictured rendering below) at the France pavilion and a new E-ticket attraction based on the rockin’ and action-packed world of Guardians of the Galaxy. Fans of Mission: SPACE will soon experience a new Green Mission, which will take guests on a tour around the world and an updated Orange Mission, making the trip to Mars even more spectacular. And a new restaurant, next to Mission: SPACE, will transport guests into outer space for an unforgettable dining adventure. Magic Kingdom. An all-new Tron-themed attraction will blast off near Space Mountain and a new, live entertainment theatre will find a home on Main Street, U.S.A. The theatre will be based on the iconic Willis Theater in 1920s Kansas City where Walt Disney once lived. New Transportation Options. Completing the immersion so guests never to have to leave the magic while on a Disney vacation, plans were unveiled to make getting around Disney World even more fun. Minnie Van service will provide point-to-point transportation, and Disney Skyliner will give guests a birds-eye view of the resort. 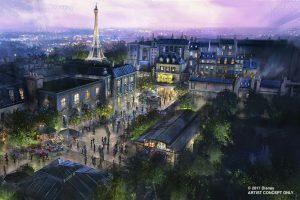 This new system will connect Disney’s Art of Animation, Pop Century and Caribbean Beach resorts, and the proposed new Disney’s Riviera Resort, with Disney’s Hollywood Studios and the International Gateway at Epcot. Pixar Fest, a limited-time-only, all-things-Pixar celebration will launch at the Disneyland Resort in 2018. The celebration will include a new fireworks spectacular, as well as special characters and entertainment experiences. Also, as part of the celebration, Pixar Play Parade will return to the resort, this time in Disneyland Park, and fan-favourite Paint the Night will move to Disney California Adventure, which has one of Disney’s longest parade routes. Pixar Pier will open in Disney California Adventure next summer. This area, currently known as Paradise Pier, will take on a new look as more favourite Pixar characters and stories come to life, from The Incredibles, Inside Out and even more Toy Story. A new ship will join the fleet, joining two others announced last year and bringing the total to seven. All three new ships will be powered by one of the cleanest-burning fuels available.